America's enthusiasm for pizza is remarkable - and why not? The pie of dough, tomato, and cheese, like a lot of our food obsessions, is so much more than the sum of its parts. Pizza means comfort, it means a party, it means Friday at school and late night college cravings. It's good cold for breakfast, ooey, gooey for lunch, and kicked up with gourmet toppings for dinner. It is pedestrian and artisanal, and I have watched probably the equivalent of several years of television devoted to it between the Food Network, Travel Channel, and The Cooking Channel. 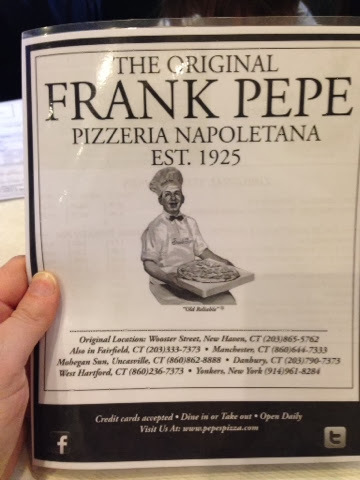 During many of those hours, for years, I have seen coverage of Frank Pepe's, in New Haven, CT. I think I first heard of New Haven's pizza culture in Gourmet Magazine, in the early aughts, when the road food column was one of my favorite reads. The couple who wrote Road Food lauded the thin, cracker-like crust and unique toppings at both Frank Pepe's and its little Italy rival Sally's. This rivalry has since been highlighted many times on the Travel Channel's many food shows. When my brother Richard and his family moved to New Haven last fall, my salivary glands were ready to pay a visit immediately. 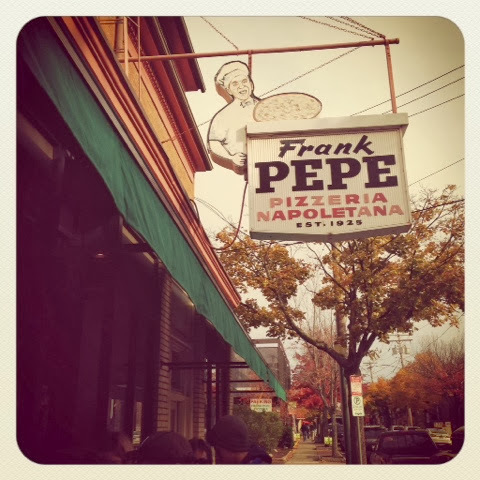 Frank Pepe's pizza shop is located on an unremarkable street in New Haven's Little Italy, across from a bar and a bakery, and next to Pepe's full service restaurant, which seems to serve locals, while the tourist-bloated pizza shop line stretches down the street. I felt like all the people eating there were laughing at us while we waited. I should also mention that New Haven seems rather quaint, with an idyllic, Federalist town square, and its waterfront parkways, but my brother reports a pretty shocking crime rate. So, you know, don't let anyone steal your pizza, is what I'm saying. But the condescending stares of anonymous New Englanders don't scare me! After a relatively quick half hour or so in line, we found our seats and pizza bliss. 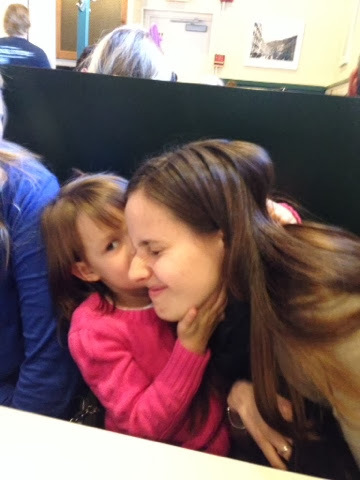 We started with a bottle of the house soda, white birch beer from a local, Conneticut producer - it was sweet, but bracing - and a nice salad to share, plus a cuddle from my adorable niece Georgia. And before we knew it, the main event was upon us. Because I like to test out what the TV has told me, we got the clam pie. Yes, you read that correctly. 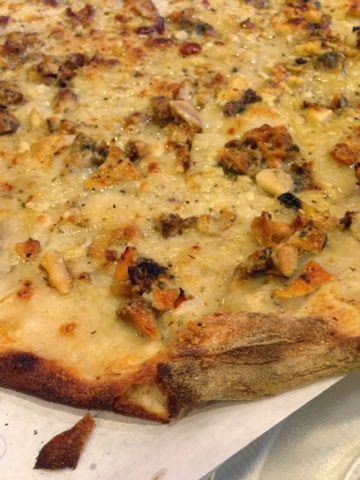 Pepe's puts steamed clams on white pizza with lots of garlic. We asked for bacon on ours, which I have been told is the clutch combo, but sadly, the bacon didn't save this one for me. I didn't love this pizza as much as I wanted to - clams are just a little fishy for me outside of a traditional chowder setting - but I have to admit that the thin, crunchy crust soaking in that glorious, buttery garlic oil was utter glutton Heaven. And you know me, I'll eat just about anything, whether I really like it or not. If you love clams, you'll like this pizza, and if linguine with clam sauce is your jam, you will love it. Our second pie, a straight up margarita, was my jam. 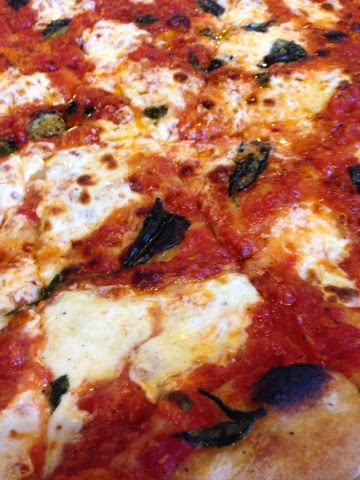 The tomato was sweet and bright, the fresh mozzarella cheese was full-flavored, bubbly, and browned, you could taste fresh basil, and that crust was really living up to its potential here. For a thin crust pizza, this pie was more luscious than I expected, a really satisfying amalgamation of crisp dough, gooey cheese, and strong, classic Italian flavor. I would eat this pizza everyday, and never complain. I particularly loved the charred bits of crust on the edges - the signature of a great oven running hotter than hell's seventh circle. Hoo boy. May I have another slice? Service is brusque at Frank's, though not unfriendly, and you should be kind to those in the line outside by eating your 'za and getting the heck out, toot suite. That's good manners, man. That dude looks dubious about my photography, but these guys were actually really fun, and look at all that gorgeous pizza and subway tile. That's the name of my memoirs: Gorgeous Pizza and Subway Tile. Just kidding. But see that oven? That's where the magic happens, all embedded in the wall and reveling in its own charcoal-fired glory. 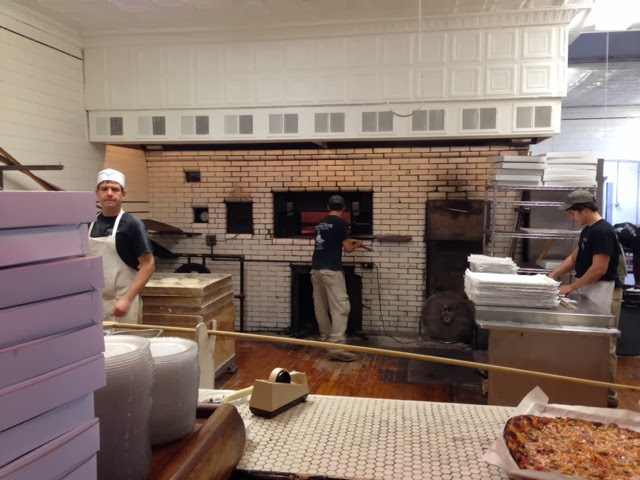 That oven is an antique, and the pizza it cranks out can't be imitated by newer, commercial ovens. It's the real deal, baby. Next time I visit Richard and Liz, we may have to hit up Louis Lunch, which is the first restaurant in America to ever serve a hamburger, but I'm going to put in a plea for a return trip to Pepe's too. There are more toppings to explore here, and with pizza this good, I wouldn't mind hitting up the bustling locals-only spot next door and see what kinds of pasta these guys can muster up. I highly recommend adding Pepe's to your culinary tourism to-do list, as I thoroughly enjoyed our entire lunchtime visit. 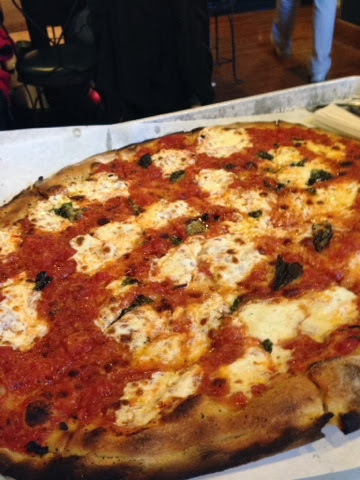 If you've sampled Pepe's pie, let me know in the comments. My hunger is big; my personality is bigger! I can't believe you didn't love the clams. I am defriending you. Just kidding. I'm just judging you. Also, this literally made my mouth water. Literally. 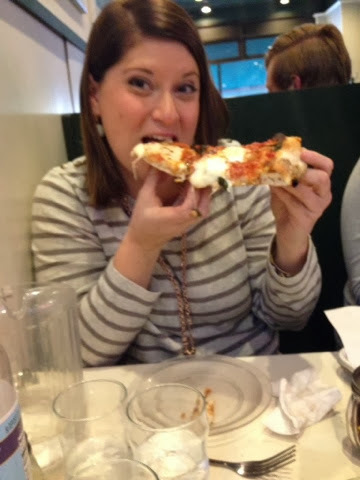 The clam-lovers at our table completely loved that pie, and overall, everyone left happy, and my brother and sister-in-law now have a favorite pizza joint in their new hometown! Thanks for commenting, and a huge thanks for the outstanding lunch! Do you deliver to Upstate New York, by chance? I would totally like to try the clam pizza! This looks so good. I'd definitely try the clam pie and just about any other kind.